Description Wise Chess Club meets Tuesdays at 7501 Goodman Rd. Olive Branch, MS at 7PM to 9PM (Panera Bread). 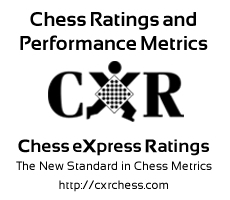 You can play casual games at agreed-upon time controls, but a last minute tournament can happen, and it is all under CXR (Chess eXpress Ratings). Take a break from your chess sabbatical and join in the exercise of your hobby. If you played chess in the Mid-South area's clubs in the 70s through the late 90s then you will recognize some of the chess atmosphere from bygone daysy. Friendly banter, good-natured kidding, post game analysis, and games that you actually have time to write down. As a CXR member you can play a rated match at anytime without a rating fee. Simply report your games to me, name of the opponent, what color you played, time control (7min SD and above), and outcome (flag, resignation, mate, or whatever).